Very occasionally we will all suffer from catastrophic plumbing and heating issues that cause a lot of stress in our lives and a lot of upheaval within our homes or place of business, however most of the time the issues that we have been minor annoyances that we tend to ignore until they become too much or until they escalate into one of the larger problems. In this article I’m going to cover a few hints and tips when it comes to plumbing and heating, including some things that you can do yourself and some things that you should just bear in mind when it comes to your plumbing and heating systems. Let’s cover some of the more common problems and potential solutions for them and then I will give you some general hints and tips. In itself this is a very minor issue however it can increase your water bill and over time the constant sound of water running can become quite annoying. The issue is normally the float within the toilet cistern being too high and this can be caused by worn parts and also by the existing parts not been put together properly in the first place. Cleaning, adjusting, and even replacing parts is a very simple thing that you can do yourself and all of the parts that you will need are readily available from any DIY store. If you have pipework that is exposed to very cold temperatures then it should be insulated however a sound not and they become frozen this could cause them to crack. To resolve this problem you will need to thaw them out which should be done with a hairdryer or towels have been dipped in warm water. You should never expose frozen pipes to direct heat because this can again cause them to crack and you will end up with water flooding everywhere. Again this is another minor inconvenience however will soon become very annoying when it is a very simple thing to fix. 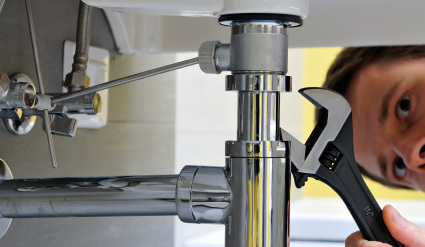 Quite often a dripping tap will be caused by a washer that needs to be replaced. On most taps this is a very quick and easy job to do however if you are unsure about it then you should contact a plumbing and heating contractor who will be able to do this for you without the need to spend too much money. Don’t panic when things go wrong. I know that it can be difficult not to panic if you have water leaking out of a pipe all over your carpet but one we are in a state of panic it is very difficult to make the right decisions and with therefore need to try and remain calm at all times. Make sure your heating system is maintained. This is something that you can employ a plumbing and heating company to do for you and it is something that only needs to be done a couple of times each year in order to avoid larger issues. Be prepared for problems. This involves having the contact information for reputable plumbing and heating company somewhere that it will be easy to find. It is always worth locating a company that can do this kind of work for you before any issues arise, then when you do have a problem the resolution can be very quick and efficient. Be aware of the location of your shut-off valves. As simple as this might seem there are still a number of people who would not be able to tell you where there shut-off valves are located however quickly being able to shut off water within your home can save you a lot of trouble having to claim on insurance for excess water damage.